I’ve had some flack directed my way for calling things such as TONI ERDMANN over rated (My ERDMAN review is here). I am told that is not the way I should talk about a film. 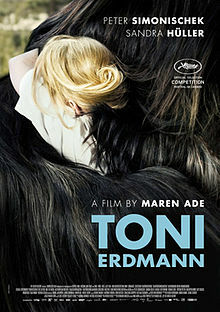 Perhaps, but at the same time with films, particularly ERDMANN the film is being held out as the savior of cinema. Film Comment has a cover story to that effect that ERDMANN was the next big thing. The reviews coming out of Cannes and elsewhere have promised something mythic. Additionally people I know have been talking the film up based on what has been said about it as if was a religious experience. If you love film you cannot have been unaffected by the talk. …and then Dennis Lim came out and spoke about the film in a way that one talks about a religious awakening. There was going to be something magical here, a tightly crafted film that surprised at every turn. Every frame was going to dazzle in ways unknown previously. If we had been at Cannes he told the rapt audience we would have been there when something magnificent hit the earth. Soon we would see the film and we too would watch as the heavens opened. Or something similar. Lim’s introduction was something akin to watching a religious zealot speak. And the film started and I waited. And nothing. There was some laughs, some drama but the film wandered all over the place. Things rambled on and it ended perfectly 20 minutes before it actually ended (The furry hug). The film finally spun out to some uncertain mumbling of a conclusion. Normally I can see why people are raving about a film (I completely understand the love of MANCHESTER BY THE SEA and I DANIEL BLAKE), but with Erdman I had no clue. Why all this over blown love? Walking out of the film I had no idea. Where was the greatness? I didn’t see it. Many of the people around me didn’t seem to see it. There wasn’t much talk of the film as there normally is. People either lined up for MOONLIGHT or went off to dinner. As stood in the foyer taking notes I was filled with snarky thoughts. I knew I was going to review the film, but I also knew that unless I expressed it in a contrary manner I had nothing to say. Knowing I would take flack, I decided to speak from the heart and say what I felt- which included saying it’s over rated because that’s how I felt. I couldn’t not say that because the film community attached it to the film. And that’s what I did and so I’m calling TONI ERDMANN an okay film that has an wildly inflated reputation and running time. Is that the correct way to label a film for a writer? Probably not , but at the same time what is correct isn’t the right thing to do. Sometimes you have to break the rules. Mostly you have to speak your mind to be truthful. That’s what I’ve done. If you don’t like that my saying it’s over rated then simply know the emperor has no clothes.